A question that comes up quite frequently at our practice is, “Should I see a Chiropractor for neck pain?”. In general, pain is a sign that something is not quite right. We tend to mask it temporarily with painkillers and hope it goes away. Most of the time it does, but invariably it comes back and usually a whole lot worse. In this blog, I will explain why this happens, and how you can put an end to it. I am a firm believer in taking a proactive approach towards health. If something is hurting, find the reason for it, and fix the problem. Neck pain is one of the most common conditions I see in practice. Unfortunately, our modern-day habits of sitting at our desks, hunched over laptops and staring down at our phones is taking its toll. New terms such as tech neck and text neck have been coined because of the prevalence of poor posture and neck injuries, related to our overuse of technology. THE OFFICE WORKER – The most common scenario I see in practice are the patients that spend all day hunched at their desks. The typical office worker. Their neck and shoulders start to ache at the beginning of the day and worsen as the day progresses. They often have a hunched forward posture. THE LONG TERM SUFFERER – This is the person who has battled for years with a neck problem. It tends to come and go. They will have moments where life is great and then something will happen to trigger it and they are in pain again. This might be a stressful period or a longer/busier than normal day at work. No matter what they try, they will get relief for a while but it always comes back. I DON’T KNOW WHAT HAPPENED – This is the person who goes to bed feeling great and wakes up unable to move. It could be triggered by a new activity, fall or even a sneeze. Something has happened to cause the neck to lock up, become stiff and sore. The Common Underlying Cause for Neck Pain That is Often Missed. There is often a common underlying cause for the above scenarios, which is unfortunately often overlooked – Structural Misalignment. Very simply, in order to function optimally our necks should have a C-shaped curve from the side (Cervical Lordosis) and look straight from the front. There are many reasons why you may lose this ideal shape, and they all result in more strain on the structures of the neck. This strain leads to weakness, which makes your neck more prone to injury. It can also lead to much more serious consequences long-term, such as degenerative changes. The underlying reason why you should see a chiropractor for neck pain. After looking at thousands of neck X-rays, it is clear that this is a very common problem, but most people do not even know that they have it. 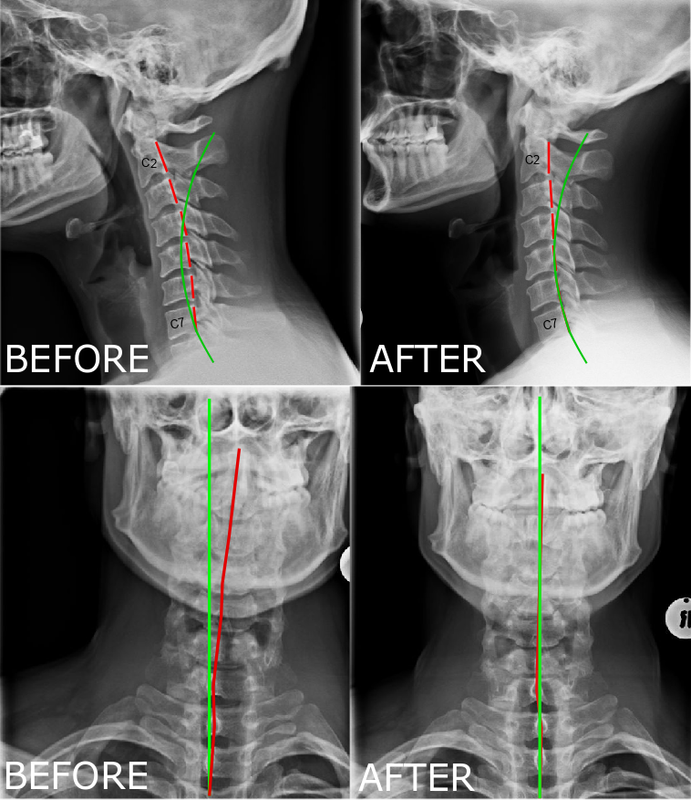 Even though the neck alignment is not yet ideal, it has improved dramatically in the space of a few short months following a Corrective program. So, you might have a normal day at your desk, or a stressful moment or fall asleep in an awkward position, but because your neck is structurally misaligned, it cannot handle this strain and ends up hurting. We either tend to ignore the pain and hope it goes away, or try a variety of “quick fixes” to reduce the pain. This approach does not fix the underlying cause, so often the same scenario repeats itself over and over again. At Align Corrective Chiropractic in Durban, we focus on structural correction. We use X-rays along with a number of examinations to determine exactly where your problem is originating from. We then design a program specifically for you to correct it. So to answer the question “When should I see a Chiropractor for neck pain?” Ideally before you have neck pain. If you are looking for neck pain treatment in Durban, then give us a call on 031 562 9180. What to expect – First Chiropractic visit.